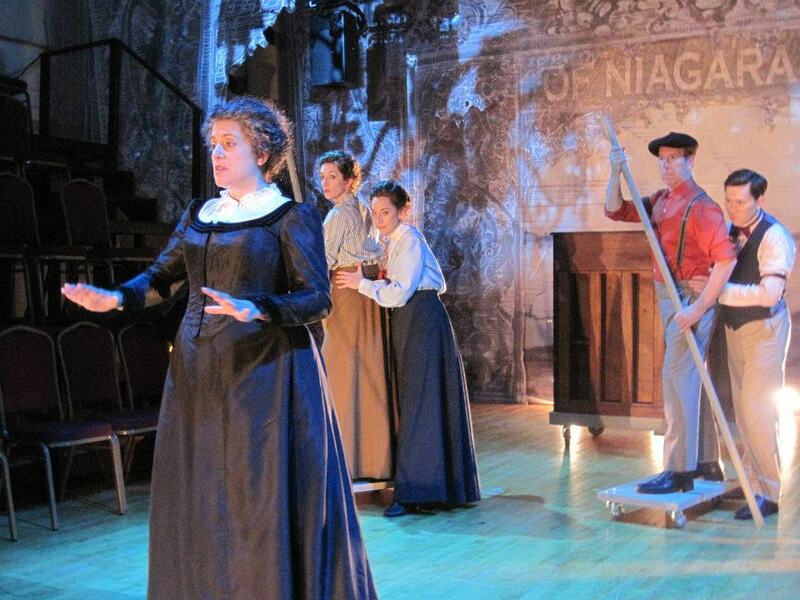 It’s almost certain that every review of Transport Group Theatre Company’s production of Queen of the Mist, the new musical by Michael John LaChiusa, will assert that, like Niagara Falls, star Mary Testa is an indomitable force of nature. 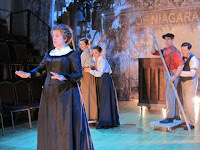 As Anna Edson Taylor, the first person to go over the horseshoe falls in a barrel and survive, Ms. Testa channels a holy madness: she dominates the piece as a woman unshakably convinced of her own rightness, voracious for approval and acclaim (and money), yet who is unable to articulate her own experiences to the satisfaction of a fickle public. The story begins near the turn of the 20th century as Taylor, a purveyor of dubious lessons of all sorts (music, dance, “female hygienics”) is evicted from one small-town studio after another when she fails to attract paying students. She wears out her welcome at the home of her sister Jane (Theresa McCarthy) with her habits of bathing three times a day and warming her socks on the stove (she carries on a languid conversation with Jane while lolling in a clawfoot tub); with nowhere else to go, she soon finds herself at Niagara Falls, a magnet for hucksters and daredevil stunters of all stripes. Convinced that those who have died (by drowning, dismemberment or worse, suffocation) in their attempts to master the falls simply “lack science”, Taylor methodically designs a barrel which she hopes will enable her to survive the plunge. (“Cradle, coffin, carriage, casket” she muses as she formulates her design.) In need of a promoter to wring the maximum amount of money out of her scheme, she finds only sharpster Frank Russell (the lanky and compelling Andrew Samonsky) willing to take her on. Although they each have a wary eye on the other, suspicious of betrayal and double-dealing, Taylor and Russell develop an unlikely friendship. In the months and years after her adventure, Taylor dutifully recounts her tale from the lectern, but finds herself unable to give her audiences the thrills they demand. Dismissed by the highbrow Chautauqua lecture circuit as a stunt, and unwilling to play vaudeville stages, Taylor is soon taking second billing to bigger draws like temperance crusader Carrie Nation (the razor-sharp Julia Murney) as her fame dwindles. Near the end of her life, destitute and nearly blind, she sells souvenir postcards by the edge of the falls. Here is where LaChiusa’s version of the tale breaks the boundaries of biography and leaps into a stunning epilogue: a lyrical fantasia unfolds in which Annie reencounters key figures from her life, and relives the life-defining fall in a moment of ecstatic transcendence. “There is no beautiful, terrible why,” she cries, as she tries to fully understand her own motivations. The evening is given a vaudeville frame: the ensemble first appears around a piano, harmonizing on a ragtime-inflected tune. Director Jack Cummings III, the Artistic Director of Transport Group, transforms the entirety of the space at the Gym at Judson into a vaudeville stage; the haunting setting by Sandra Goldmark, using ghostly scrim and hovering chandeliers, places the steeply raked audience as though watching Taylor’s story from backstage in an endless series of stage-curtain “wings” which stretch from one end of the space to the other. 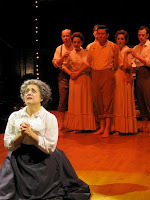 Ms. Testa plays her early scenes in a deliciously inflated vaudevillian style, capturing the stentorian delivery of a nineteenth century orator in monologues which seem to unspool in one long cascading breath. She has a remarkable, regal stillness about her through much of the piece – at times she barely moves, but is the absolute center of attention. Each member of the cast has standout moments: Ms. McCarthy brings a Lillian-Gish-like flutter to sister Jane, while uncorking a Betty Hutton-esque brashness in the role of an imitation Annie. DC Anderson finds comic high notes in a range of roles from the barrel-maker who builds Anna’s contraption to a hapless manager; Tally Sessions, in melodrama-villain coat and collar, is both menacing and moving as a man Anna encourages during a chance meeting at the Pan American Exhibition in Buffalo. Stanley Bahorek, in a straw boater, displays vaudevillian virtuosity, tickling the ivories while the piano is being rolled from one of the stage to the other; he later makes a memorable appearance as a World War I soldier bound for the front who stops to buy a postcard from a now-forgotten Annie. Ms. Murney, a force of nature in her own right, explodes out of the ensemble in the second act, leading a battle-cry anthem (“Break Down the Door”) as Carrie Nation; she also puts her often-overlooked comic timing to good use in a brief sequence as a journalist at war with her own typewriter. The role of Frank Russell, Anna’s down-at-heel manager who seems to live in seedy saloons, is given a raffish, angular sexiness by Mr. Samonsky, who seems to have stepped out of a daguerreotype; his clear, lithe baritone navigates Mr. LaChiusa’s melodies with well-phrased agility. Mr. Cummings makes economical use of the compressed playing space, adroitly keeping the action swirling around Ms. Testa with a sure sense of pacing. In conjunction with costume designer Kathryn Rohe, who gradually shifts the cast from vaudeville plaids and stripes to an effectively understated neutral palette, Mr. Cummings gives graceful shape to the ending sequence – culminating in a powerful final image. Anna Edson Taylor was the embodiment of a quintessentially American story: the near-maniacal quest to leave some kind of lasting mark, to create one’s own tall-tale legend – or simply to get rich quick or die trying. The opportunity to see Mary Testa in the intimate Judson space in a role tailor-made for her should not be missed. QUEEN OF THE MIST, presented by the Transport Group Theatre Company, runs through November 20 at The Gym at Judson, 243 Thompson St. For more information and tickets, see www.transportgroup.org. I cannot imagine a more balanced, informative review. The show is a treasure and Hartmann's review is so much more inspired and full of information and understanding of the form than Ben Brantley's in today's New York Times.